For most iPhone and iPad users the stock Messages app is one of their most used sections of iOS. We all use Messages to connect with family and friends due to which the app can get super crowded making it hard to find the conversation thread you are looking for. The situation gets worst when you have many ongoing conversations that are for both work and personal contacts. 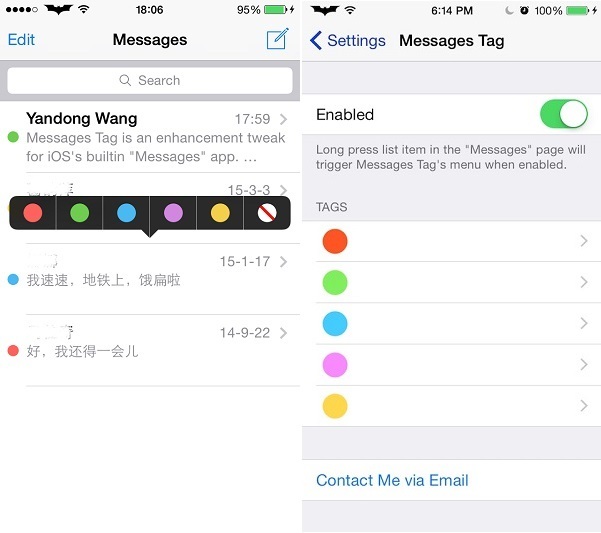 To make things less frustrating for iOS users the new Messages Tag tweak has been released that allows users to color tag conversations. The tweak only adds a color tag to the thread, however what that means is entirely up to you to decide. There are 5 color tags available including red, green, blue, purple and yellow. While these are the default color options you can customize them from preferences page. You can assign a color tag to any thread by long pressing on it and then selecting the desired color from the popup menu. Since you get 5 different colors to assign you can make up any meaning for them according to your own situation. For example you can priortize threads by marking them with a dark color while the less important ones can be marked with a lighter color. Similarly you can select a different color for work related threads, family threads and threads that belong to your friends making it easier for you to find them. The meaning of each color tag is entirely up to you to decide. You can uncolorize any thread by simply long pressing on it and then hitting the ‘clear’ button located last on the menu. 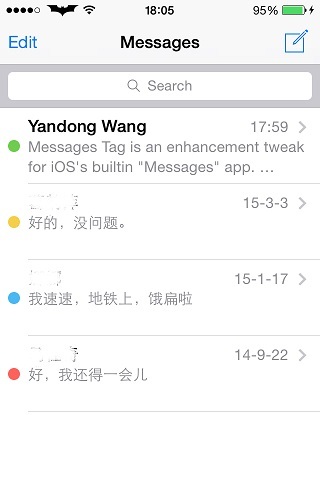 You can download the Messages Tag tweak from Cydia for $1.99. It is compatible with both iOS 8 and iOS 7 powered devices.